On the surface of the chain-links obviously very strong scars caused by corrosion were existing. The material should be solution annealed. 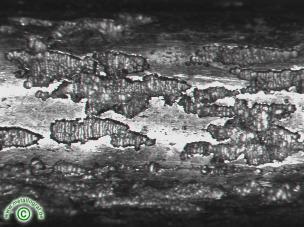 A microsection examination showed an austenitic structure with little amounts delta-ferrite and a grain size of 4 - 6 . The large quantity of carbide precipitates in the microstructure allowed the assumption that it is a not sufficient solution annealing of the wire material. A nearer examination of the structure at the surface showed amplified fine carbide precipitates on the grain boundaries and in the grain. By the carbide precipitates the resistance against corrosion has been reduced drastically because of the chromium loss in the environment of the carbides. The chain was exposed to the sea water as a ship chain.